Business Entity Types: The main types of business registration are shown in the table, but there are a few variants, such as the Social Purpose Corp in CA, or the Public Benefit Corporation in CO. Check the latest status with your Secretary of State’s office in your own State. The L3C hybrid entity can attract private and philanthropic capital (so-called ‘program related investment’ or PRI from a 501c3 or government grant) to enable a socially beneficial objective. 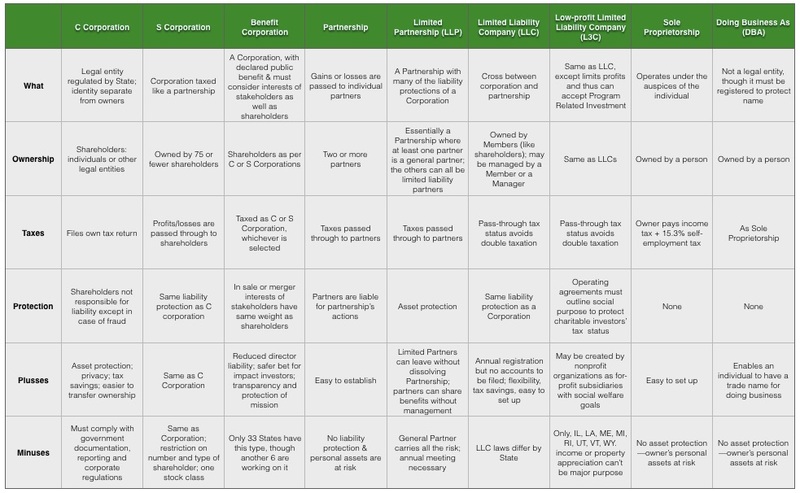 Among business entity types, the L3C has a charitable mission as a primary objective, while at the same time it is free to distribute the profits to its members. Several other hybrid entity forms are being created, such as back-to-back for profit and nonprofit entities. Private Operating Foundations, a seldom used formula, can have for-profit subsidiaries. Vermont has a very successful one in the Windham Foundation, that operates the Grafton Inn and Grafton Village Cheese. The private operating foundation is a model that may prove to have an exciting future for social enterprises. Vermont is also among only a handful of states in which you can create and operate your business digitally—without a physical presence within the State. This is called a digital, or virtual, company. In any case, you should discuss your business registration options with the office of the Secretary of State in the State where you’ll be operating. In my experience staff members are very willing to guide you towards the best solution to meet your purpose, in many cases avoiding the expensive recourse to using an attorney. There has been an emerging fourth sector for some time now. The concept was originally recognized by the Aspen Institute in its 2009 report, The Emerging Fourth Sector. This essentially is about the overlapping and converging of the the three traditional sectors of for profit, non-profit and government, as each seeks to make our world better meet people’s needs. What I have observed more recently is that the business registration situation has become even more complex, as founders create new arrangements that best suit their own purpose, using different forms in combination and an application of IRS rules to suit their own needs. So, for example, as Non-Profits struggle with traditional forms of fund-raising, they go to the limit of the IRS rules on how much trading they may do, in the form of mission-related business activities. Other people in the commercial sector operating what are commonly called social enterprises, seek to deliver social benefit using commercial models. There are hundreds of examples, such as Better World Books, Newman’s Own, or Tom’s Shoes. There are other creative examples, such as Prosperity Candle, established by a friend of mine, Ted Barber. He established a a new and innovative model for helping lift women and families out of poverty, through two aligned organizations – a social enterprise and a nonprofit – that work together to solve a problem and deliver sustainable impact: disadvantaged women in war-tern countries. Worker-owned co-ops and employee-owned businesses (ESOPs) are more established models that do not exactly fit the mainstream business model, though they do require business registration. The Coop Development Institute has very good guidance of the differences between the two. Both, of course need to be registered with the State. Founders of startups that don’t scale to IPO size can use Co-ops and ESOPs as an exit strategy, when the time comes to retire or move on. You need to be very convinced about the purpose of your venture to decide which way to go in terms of the business entity type that you choose. If there is no established structure that suits you, don’t be afraid to find or create an innovative one that will! This should be normal thinking for innovative founder founders of purpose-driven startups.